We’ve been working on two major things since the last update, and a few other things. Here’s the lowdown! We added enemies into the second half of the game, which was a BIG task. 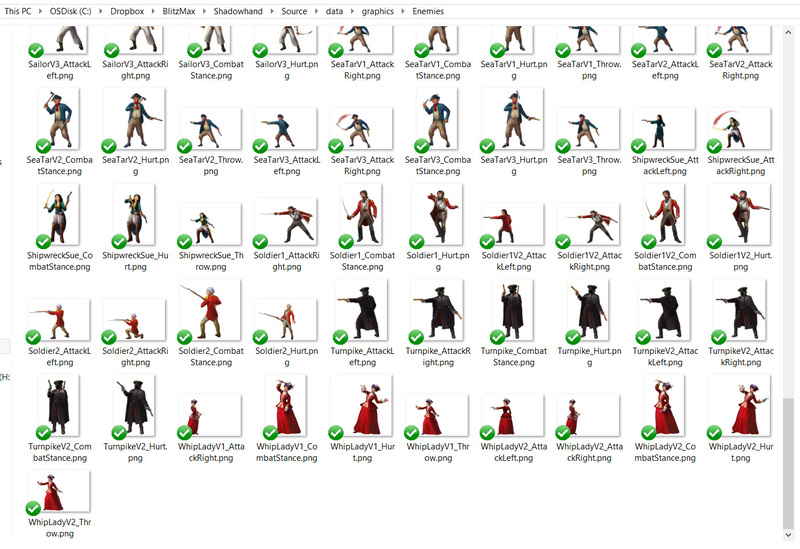 For almost a year we’ve been sitting on the art for the remaining enemies because we knew it was going to take a while and there were a bunch of other things that needed doing more urgently. Anyway finally they’ve all been edited and plugged into the game! First Jake uses Photoshop to fixes errors in the source psd files. 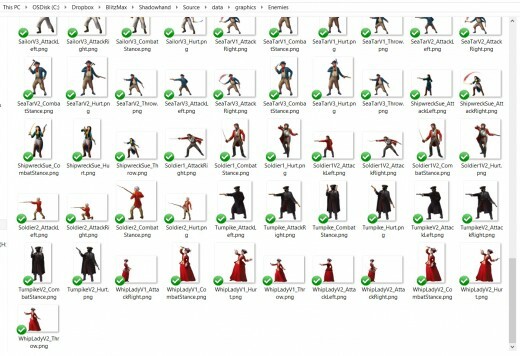 He check the poses, hands, weapons, outlines, transparency and other stuff. Then he plugs them into a master enemies psd file and scales and positions them to be consistent. Then those images are exported and loaded into the game and offsets are calculated for enemy strikes on the player and vice versa, and gun smoke particles are added where relevant. 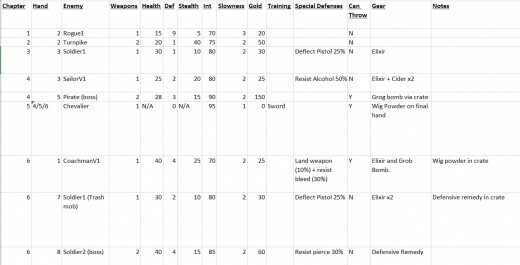 Once the enemy graphics were in the game we made a giant spreadsheet of all of the enemies (see snippet above) in order to assign them properties such as health, defense, stealth, gold, special defenses, gear etc. However, they all still need to be tested and balanced using the automated AI duelling system, which will be done soon. Another big change was that there’s now a new save system that basically records two different states: the state at the start of the chapter and the state mid-chapter. This way if players fail a chapter and retry, or quit a chapter, the state can be reset back to the start of the chapter. The mid-chapter state is just the most recent save that gets loaded if the player shuts down the game mid-chapter OR if they retry a hand, perhaps due to losing a duel. 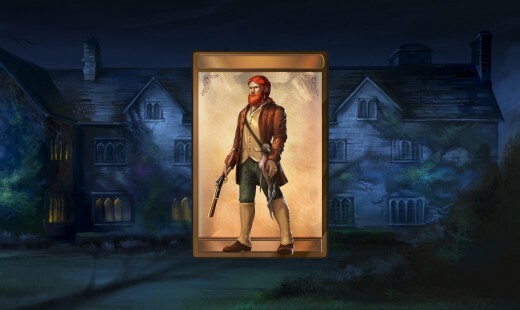 It was weirdly complex and took a long time to get right, and it’s a departure from the way that Regency Solitaire handles chapter/hand progress, but it was needed due to having an inventory system that can change mid-chapter. – Added a Play/Equip panel before puzzle hands so that players can swap out active/passive abilties. – Fixed a bug with restarting a hand not rolling back some chapter stats for the current hand. – Made mirrored throwing knife and rat particle effects for when they are used on the player. – Added separate x offset for bombs hitting enemies so it doesn’t have to be the same as gun impact x. – Enter and Space can be used to activate the Retry button on Level End screen if there’s no Next/Loot button. – Added second blood splat/pow to pitchfork because it has two prongs. – Made special weapon cards for the Ostler’s various punches. 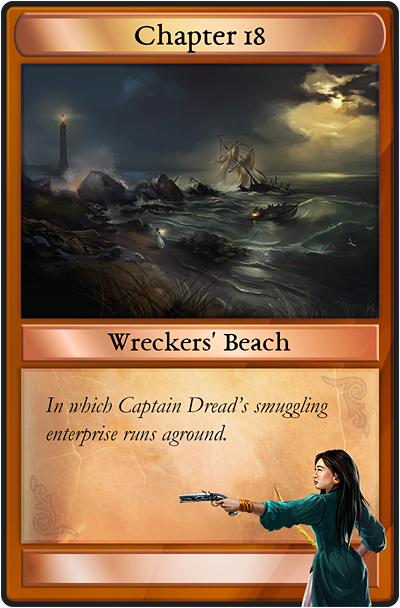 – Made special weapon card for Whip Lady’s pistol. – If there are two crates on a level the 2nd one doesn’t fade in! FIXED. – Set music for all new enemies. – Edited chapter names and shop message text. OK that’s it for now. We’ll try and upload a video soon. We are getting there! This entry was posted on Tuesday, October 24th, 2017 at 1:15 am and is filed under Developer Diary, Grey Alien Games. You can follow any responses to this entry through the RSS 2.0 feed. Both comments and pings are currently closed. It’s been interesting following the game’s development. Just looking at this I know I would hate the life of a game dev, and this isn’t even a highly complex game by today’s standards. 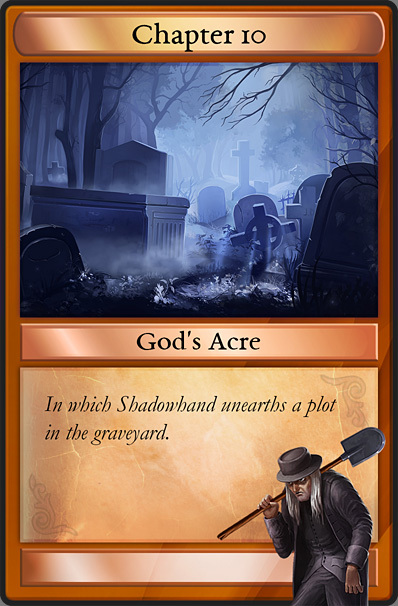 Anyway, I’m looking forward to Shadowhand’s release. Will it still make it this year? Hi there, it should be this year if all goes to plan! But I have also given up on making promises as things change.